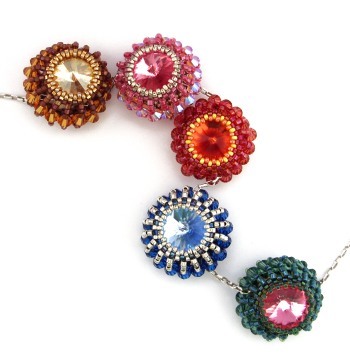 These beaded pendants are double-sided with a rivoli crystal held securely in each side. The two separate pieces are then joined together with extra crystals, through which a neckwire, chain, cord etc can be threaded. They can be worn one at a time or as many together as you choose. These were published in issue 18 of Bead magazine and the instructions will be available to buy here in April 2010. Click here to see the reverse sides of each pendant.